As motorcycle riders we all love to be “in the wind”. Lately that phrase seems to take on a whole new meaning. Last year around this time, heading out for a ride involved constantly dodging raindrops. Now it seems like every other week I’m trying to stay upright in extremely heavy wind gusts. Unfortunately, this weather usually coincides with the garbage collection schedule once or twice a week, which leads to an annoying round of the how-many-houses-away-will-the-trashcan-be-today game. I don’t remember all these high wind warnings and advisories occurring as frequently or violently in the past. Actually before I got my own bike, I really didn’t consider how much the wind could affect a ride. It didn’t take long to learn that lesson. I’d only been riding my own for a few months and was still on my first bike, a light little Suzuki Savage 650. When I met up with a buddy for a scenic ride in the country, he mentioned that the forecast for the afternoon was windy. We decided to head out anyway and although I don’t remember what speed the gusts were that day, I do recall feeling like the wind could blast me off the road or into the lane of oncoming traffic. At our first stop my friend asked how I was doing. Trying to keep my voice from shaking, I told him I didn’t mean to be melodramatic but I was truly scared of the wind pushing me into losing control of the bike. It was a huge relief when he reassured me that even with a heavier bike and more riding experience, he wasn’t comfortable either. Luckily, the breezes slowed throughout a lunch break and had gotten much more manageable before it was time to head home. Several years and another bike later, I was again caught by surprise on a blustery afternoon. This time, the ride to work on my Sportster had been relaxing. The return home however, was quite a different story thanks to unexpected gusts from 45 to 50 mph. I tried to stick to the backroads in the woods where there was a little more shelter. Inevitably, a break in the tree line would send me out into the open again to be walloped with another gale. I weebled and wobbled for a good 30 minutes, wondering part of the time if the driver of the van behind me was going to call the police and report me as a suspected DWI! Laughing about it afterwards at a local bike night, a bunch of friends teased me and said I probably wouldn’t like riding in the plains or flat parts of Texas. One buddy reminisced about a day-long trip he’d taken, spending the whole time leaning into the wind almost sideways to keep from being blown away. I can’t imagine. Still, I dream of eventually getting the opportunity to take a cross country trip- different weather included as it’s part of the adventure of different sights. This season, to one extreme or another I’m sure we’ll get lots of practice riding in all kinds of conditions here closer to home. Practice makes perfect? I’d say any ride makes for practice that IS perfect! A winter storm passed through this part of the country leaving everything coated with an icy glaze for a couple of days. Once the roads were cleared, people gradually got back to their normal routines. This time of year that usually means I’m commuting to work while it’s still dark. But a delay after a morning trip to the veterinarian’s with my dog meant driving my truck across a mountain as the sun was rising. I wish I could have taken pictures because I don’t think I can describe how truly incredible the view was. All the different hues of daybreak were reflected off the frozen trees, every branch sparkling as if thousands of twinkling lights had been strung throughout the woods. It was so breathtaking I’ve thought about it often, trying to make sure I’ll remember the scene and store it with other mental snapshots of mine. Small moments like this do so much to soothe the ache of waiting for better riding conditions. Even though I had to constantly watch for patches of black ice, and it had been several weeks since it was nice enough to get out on the bike, I realized how much I do love the beauty of all the seasons in the Mid-Atlantic. Whether your winter downtime consists of a few weeks or a few months, at least it’s a good opportunity to get the bike ready for when it is riding season. As I’ve mentioned before, there is value in taking a basic rider course from an organization like MSF. Not only will you learn important riding skills, but also tips on caring for your motorcycle. Although it’s been quite a while since I took the class, I can recall the acronym they gave for the pre-ride motorcycle inspection checklist: T-CLOCS, Tires, Controls, Lights, Oil, Chassis, and Stands. I will admit, I have to search that on the web to get into the full details of each category. It seems there’s no more room in my brain to store them between those photos committed to memory and about 1,583,033,206 different song lyrics. Oh, and of course, riding memories! So even if you have to refer to a list like I do, or you’re so familiar with your bike maintenance routine that it’s automatic, make sure you take advantage of foul weather days to give your ride the TLC it needs. Nobody wants to wait out the cold weather only to miss riding when a nice day arrives because there is something wrong with the motorcycle. The same goes for finding out there’s an overlooked issue with the bike that leaves you stranded on the side of the road. When I first started riding I was guilty of taking off without spending-a minute to look over even just the basics. During a break on a ride through Luray, my buddy “Skid” was checking out my bike and noticed some sort of blemish on the rear tire. There was a cut in the tread that didn’t appear to be leaking air, but he didn’t like it. The tear could have been made by running over something that day, but because I hadn’t given the tires a simple once over before I left home, I couldn’t be sure. There happened to be an auto-parts store next door, and he asked me to go over and pick up some Fix-a-Flat just to make him feel better in case we discovered I had a slow leak later in the day. His girlfriend walked with me, and after making the purchase we decided it was time to have a little fun. I stashed the can in my purse, and asked the cashier for a band-aid so we could introduce Skid to the latest and greatest in tire repair. “Yes”, I continued. “They said it would work even better if I spit on the pad first. And the best part is it only cost 8 bucks!” Poor Skid kept staring at the band-aid; he turned it over, inspected it, and turned it back again. Finally he looked up at me with an expression on his face that was all too easy to read. He was trying to figure out how to tell me I was the biggest moron on the planet without making me cry. I couldn’t take it anymore, and burst out laughing, letting him off the hook. With spring on the way, I’d advise you to invest in a service manual for your motorcycle. Do learn the basics of bike maintenance and perform them regularly. Do carry a first aid kit in a saddlebag, with band-aids included. Don’t expect them to patch a tire, but they could come in handy for minor situations like bee stings or pulling a friend’s leg! Happy New Year! I’m not one for making resolutions anymore. It seemed to become this grade school-like exercise where the assignment is to list a bunch of your petty faults, along with a set of rules to follow to fix yourself. Oh, and if you’re not perfect by March then you fail! No thanks. I do love to reflect on my favorite adventures from the past year and look forward to all the new experiences and “firsts” to come in the next 365 days. There are roads to ride, places to visit, and people to meet for the first time. 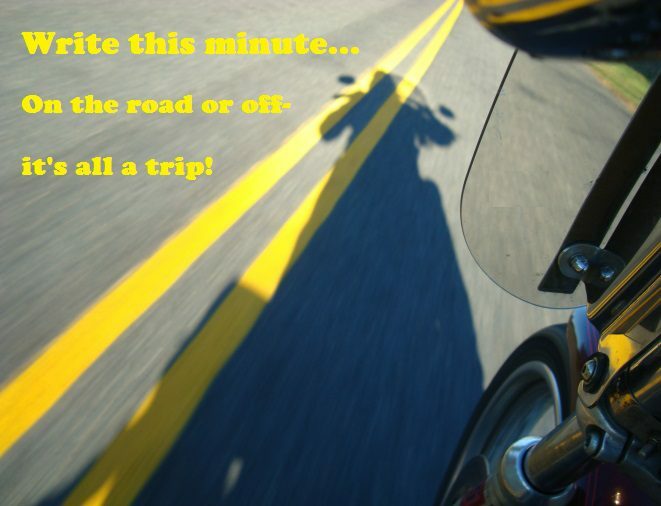 If riding your own motorcycle is on YOUR list of firsts, make this the year it happens! I dated guys with motorcycles in my teens and rode as a passenger, but hadn’t operated a motorcycle until 1998, when I took the Basic Rider Course (BRC) in Charlottesville, VA. A couple of years after taking the course, I got a job working in the Albemarle County Public Schools’ Community Education Department. The Basic Rider Course was one of the classes offered through Community Ed. I learned more about what a great service the DMV-sponsored course provided the public by the positive feedback from students. Most raved about the course, the RiderCoaches, and what a great experience they had. By 2007, I had enough riding experience and decided I wanted a better understanding of the course we offered, so I took the Motorcycle Instructor course through the DMV. It was intense; a couple of very stressful weekends of studying, gaining and practicing skills that would assist students to safely operate a motorcycle. I was the only woman in that group of 15 men to become a certified RiderCoach. My inspiration to become a rider coach started at the picnic table of my best friend’s bike shop. Several of my riding friends were talking about taking the basic rider course. It was a safety class I guessed but had NEVER heard of such thing and didn’t know it existed. They asked if I had taken the course and I was like NO, I’ve been riding 30 plus years, never been down what have I got to learn? They had ALL taken it and said you might be surprised at what you will learn. Ruth was one of those riders and she convinced me to take the class. It was a gorgeous September day on day one and it went well. It poured buckets on day 2 and was cold and miserable! What I learned about myself as a rider was amazing. I was a lazy braker, (usually just the rear and the front if needed), my cornering was marginal. There was just a lot I was not doing properly. After 2 days I was a better rider than I had been my entire life. At that moment I knew I wanted to teach this class. It was fun, exciting and it just might save a life. This student came in with nervous enthusiasm. She knew in her heart she was going to get that Ducati monster after getting her permit. She insisted on a bike that was a bit taller than we would have liked but handled it with determination. She did well all weekend and had a near perfect riding exam. When we handed her the permit and gave her her score she gave us a huge smile and said, “So I did ok for never having ridden before? !” That weekend was the first time she had ever sat on a bike!! I have been riding since my college days. The summer of 1969. We used to go hill climbing when we weren’t in class. I had a 3 gear 120cc Suzuki. It had a shifter that would cut the gear ratio in half for trail riding. I raced TT Scrambles in Lodi, CA – on a 100cc Hodaka. I didn’t ride after my oldest son was around 2 until my kids were grown. Then it was only street riding. My son-in-law was the one who wanted to become an instructor. I went along because it sounded like fun. And it was! We taught a lot together. Lots of mother-in-law jokes. It’s a great course. Within 3 days I watch people who have never been on a motorcycle become decent and safe riders. That is the most fun. Watching the light bulb go on. Changing from someone who is afraid to lean the motorcycle to someone who can ride a curve, or swerve, with good form. Anyone else in the area looking for more information on this class can go to nvcc.edu, and search for the basic motorcycle rider course. No matter what state, once you do some investigating, you’ll find a course convenient to your location to suit you along with awesome teachers like Ruth, Rod, Clark, and Maryann. One thing these four instructors have in common is their advice to new riders. All of them stress the importance of practicing basic skills and riding your own ride. In other words, don’t get pushed past your comfort zone by other riders as you gain experience. My most memorable event as an instructor was when a student came back to class Sunday morning with a hangover and still a little intoxicated. While attending a party, he had passed out in a theater and wasn’t sure what happened to his riding attire. He came to class wearing Shakespearean tights, mismatched socks, colorful slippers, and a see-through mesh shirt that didn’t quite cover his belly. He said he grabbed clothes from the costume closet. He fully expected to finish the course in that state and seemed stupefied that we sent him away. After that example, I think it would be more foolish to stay home and not take a chance on yourself and reaching a new goal. I might see you on the range too, looking back on the fun I had in my own class, this might be the year I take my first refresher course! What do you think you’re going to see when you look up? Maybe it’s this guy’s buddy, finally making an appearance at the ol’ watering hole? Do you expect to see everyone’s dream bike pulling into the parking lot? Or could he be pointing out that there’s a beautiful woman walking through the front door? In the situation I found myself in, everyone turned to see someone staring out the window…at a nasty looking, black and gray line of clouds heading our way. Resembling a dropped bag of marbles, we scattered to our bikes and rolled out in all directions before the storm hit. I don’t think police sirens can even break up a party that fast! I also don’t think I’ve seen a year we’ve received as much rain as this one! As I begin to write this, it looks like a trip to Colonial Beach, VA for Bikefest 2018 could be partially soggy. It makes me wonder if there will be ANY dry days for riding and watching the leaves fall, or more filled with rain and a transition right on into snowfall. As winter and the holiday season draw closer, I can say some of the best Christmas presents I’ve ever been given involve riding with protection against the elements. One year, my dad gave me a rain suit. With a worried look on his face, he asked me if it was too big and if I thought it would come in handy. I told him I hoped not, but it was really going to be nice to have it just in case! Naturally it has been put to good use quite often. The larger size actually works well for layering if it’s cold. Plus, we know it’s possible for gear and leather to mysteriously “shrink”, especially after all those holiday feasts! Whether you’re looking to give or receive, another great gift item that will elevate comfort and extend the riding season into cold weather is any type of heated gear. In the past, I had tried different tips and tricks I’d heard about in an attempt to keep warm. Then, my brother gave me a pair of heated gloves, and with a gift certificate from my mom I picked up a jacket liner to go with them. Simply connect it to the battery of the bike and it feels like riding with an electric blanket wrapped around you. This turned out to be the best solution for me, and really works to keep the ride pleasant enough to stay on the road when the temperatures drop lower. Particularly when that change is quicker and more sudden than expected, like during the aforementioned 5th Annual Bikefest at Colonial Beach. The lingering effects of Hurricane/Storm Michael led a small group of us to delay the ride down by a day, not being fans of torrential downpours even with rain suits. With another look at the forecasted highs and lows and the chill of the heavy wind gusts that wouldn’t diminish for two days, I unpacked some of my lightweight clothes to make room for sweats and dug the heated gear out of the closet for the trek to the festival. Once there we made up for lost time, taking in all we could up and down the beach. Much like, as my friend Sharon described, a bunch of kids running amok at an amusement park desperate not to miss anything. There were vendors and events to check out, foods to sample, and a steady stream of free live music all along this scenic stretch of the Potomac River. Area favorites like Blues Rebellion and Grindin’ Gears could be found at High Tides Black Pearl Tiki Bar and Dockside Restaurant, while The Artimus Pyle Band and Buckcherry took to the main stage at Town Hill during the weekend. The final day the breezes slowed, and I headed home with only occasional drizzle to deal with and a smile still on my face. The best part of this rally was sharing the fun with good people and making memories to look back and laugh on. May Thanksgiving and Christmas be blessed with more of the same for everyone.